John Konstantaras - For Shaw Media Marian Central's Wyatt Lindell (20) drives on Marengo's Adam Rogutich (33) during the fourth quarter of their Class 3A regional final game at Woodstock High School Friday March 7, 2014 Woodstock. The Hurricanes won the game 72-53. John Konstantaras - For Shaw Media Marian Central's Derreck Caldez (21) sinks a 3-point basket to end the third quarter of their Class 3A regional final game against Marengo at Woodstock High School Friday March 7, 2014 Woodstock. The Hurricanes won the game 72-53. 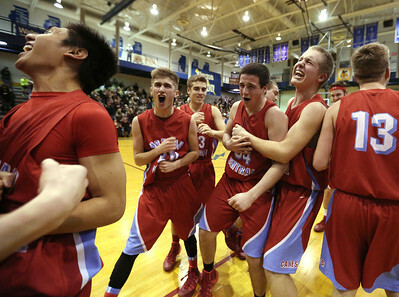 John Konstantaras - For Shaw Media Marian Central players celebrate after winning their Class 3A regional final game against Marengo at Woodstock High School Friday March 7, 2014 Woodstock. The Hurricanes won the game 72-53. 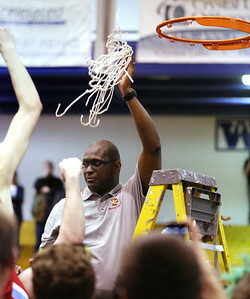 John Konstantaras - For Shaw Media Marian Central head coach Curtis Price holds up one of the nets after winning their Class 3A regional final game against Marengo at Woodstock High School Friday March 7, 2014 Woodstock. The Hurricanes won the game 72-53. John Konstantaras - For Shaw Media (L-R) Marian Central's Jack Quinlan (32), Adam Pischke (5) and Marian Central's Derreck Caldez (21) raise the regional championship plaque after beating Marengo at Woodstock High School Friday March 7, 2014 Woodstock. The Hurricanes won the game 72-53. 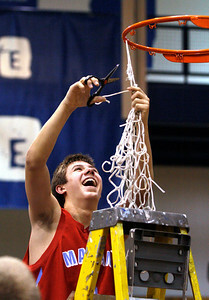 John Konstantaras - For Shaw Media Marian Central's Adam Pischke (5) cuts down one of the nets after winning their Class 3A regional final game against Marengo at Woodstock High School Friday March 7, 2014 Woodstock. 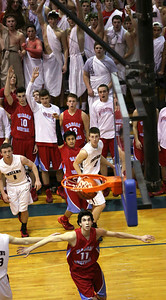 Pischke had 6 3-point baskets as the Hurricanes won the game 72-53. 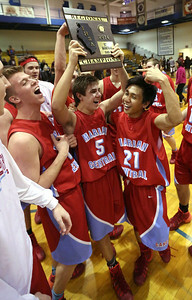 (L-R) Marian Central's Jack Quinlan (32), Adam Pischke (5) and Marian Central's Derreck Caldez (21) raise the regional championship plaque after beating Marengo at Woodstock High School Friday March 7, 2014 Woodstock. The Hurricanes won the game 72-53.